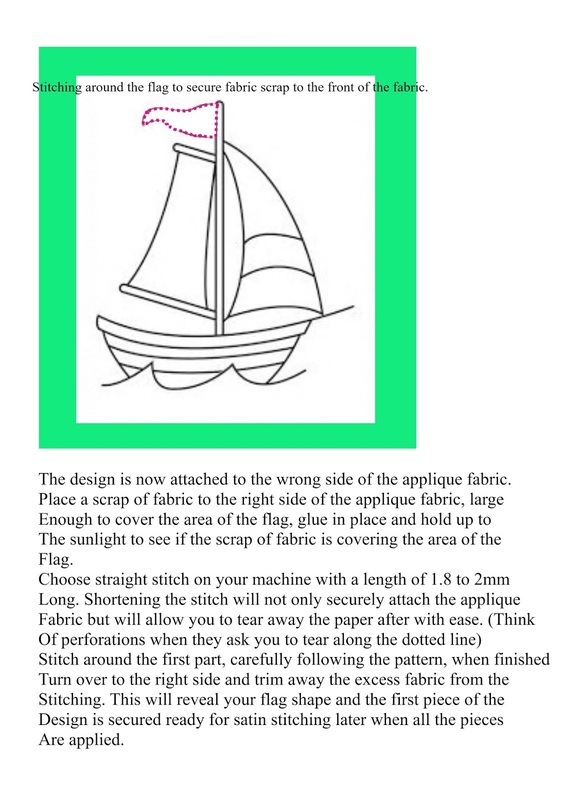 Last week I wrote about machine applique using bondaweb, applying shapes to the right side of the fabric and how to adjust your machine to make the classic satin stitch using the zigzag setting and altering width and length accordingly. 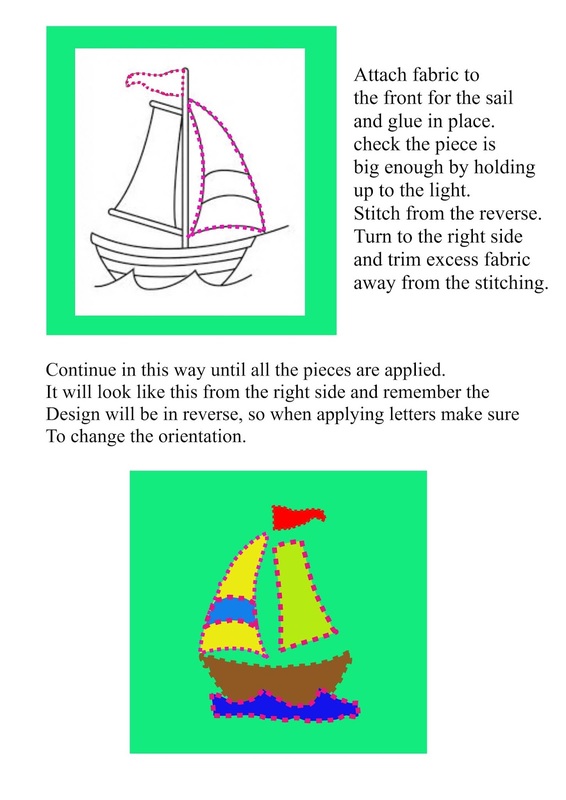 Reverse applique however, is a style of applique that is sewn with a straight stitch from the wrong side which holds the applique shape in place instead of using bondaweb. Bondaweb can sometimes be too firm for the fabrics, okay if you need that stability, but when you want a softer finish it may not be suitable. There are other bonding sheets such as misty fuse which is much softer and finer, but again you may not have all of these products in your stash! Below are some diagrams of how to apply fabrics from the reverse, there are other variations of this method but this is my method of choice. 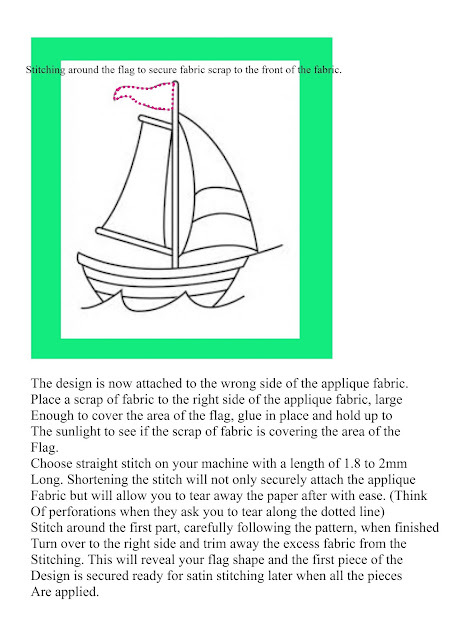 Once all the parts of the applique are in place, detail can then be added with satin stitch or decorative stitches on the machine if you have them. 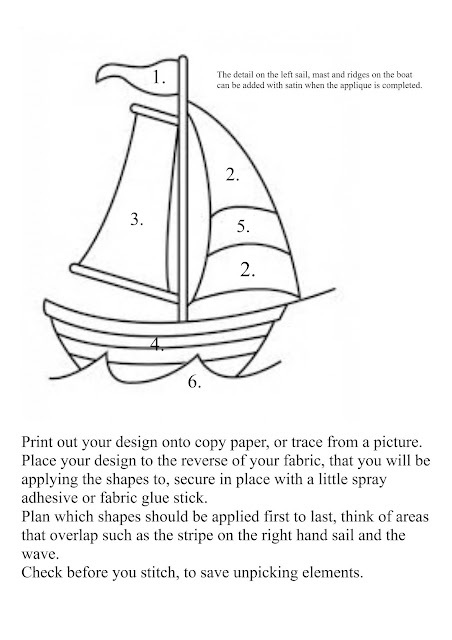 Very detailed designs can be applied in this way, just be careful of the order in which the fabrics are applied, stitch and tear can be applied to the reverse when using the satin stitch to avoid puckering. Now to some photos of the ladies work from today and the past couple of weeks. Some lovely colours being worked here, Purple and lime greens my favourite combination! We're getting there, week by week machine skills are improving, I'm determined they will one day love machine stitching as much as hand stitching!!!! A couple of weeks ago when we were experimenting with markal paintstiks I gave the ladies a challenge of using different types of materials to work on and how to think of them in a more abstract way. Below Kay has taken some Aida and stencilled Markals in triangular shapes, she has distressed the canvas and used large bold stitching to rejoin the canvas threads. I think this sample has quite a powerful statement to make even in such a small sample. Order and Chaos comes straight to mind! You would never guess what Kay used here in this little sample, but I am going to tell you because you'll be straight down to your nearest DIY shop and giving it a go. Blown Vinyl wall paper. Yes, painted with markals and stitched to a stencilled background. I love the way she has used these textured papers in her sample and could really see a bigger piece with these techniques included. City and Guilds really does help you to see the world around you in a different way, stretches our imagination and brings out the very best in us. Well done Kay! Celia brought in some fabulous embroidered panels for us to drool over. The piece below is called Mola work. Kuna women from the San Blas Archipelago produce most of the work, though some molas are also made by Kuna women from inland Panama and Western Columbia. The designs as with most embroidery have symbolic meanings and stem from necessity rather than for design sake. The work is so finely worked and is a form of reverse applique. The piece below originates from China, and is so beautifully stitched. Sometimes it difficult to believe that these were made by human hand and not by machine the stitching is so fine. Beautiful and inspiring work from the other sides of the world, and yet our passion is just as strong as theirs. Embroidery has appeal the world throughout, a true common thread to decorate and make our lives better through art and design. Yet with textiles there is that added softness and comfort that using fabric brings. No blog next week we are on half term! Don't forget do something creative this week!